Dr. Shreekant Gupta is Professor at the Delhi School of Economics, University of Delhi and Adjunct Professor at the LKY School of Public Policy, National University of Singapore. He has taught at universities in the United States, Dubai, India, Singapore and Kazakhstan. His research interests are in applied economics and policy including environment and development and climate change. During 2006-07, Shreekant was Director, National Institute of Urban Affairs, New Delhi in the rank of Additional Secretary to the Government of India. Here, he was involved in a range of activities in the urban sector including urban governance, planning, water and sanitation and transport. Earlier, he was Fellow, National Institute of Public Finance and Policy, New Delhi (1995-97) and headed the Environmental Policy Cell. 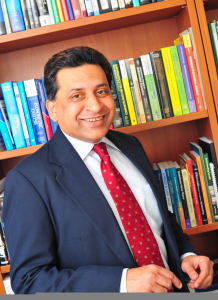 He has also worked as an environmental economist at the World Bank in Washington DC (1993-95) focusing on macroeconomic policies and the environment in Sri Lanka, Ghana and Poland. Shreekant received his PhD in economics from the University of Maryland at College Park in 1993 where his dissertation committee included the Nobel Laureate Thomas Schelling. He also has a Masters degree from the Delhi School of Economics and an undergraduate honours degree in economics from the University of Delhi. He was Fulbright Fellow at the Massachusetts Institute of Technology (2001-2002) and Shastri Fellow at Queens University, Canada (summer 2001).